The ability to automatically promote users from one group to another based on set parameters has been a staple of community software for some time. Traditionally, the most common determination of promotion has been post count. Additionally, the 4.x Community Suite supports promoting members automatically based on the time elapsed since the user joined the site and based on their total reputation count. With 4.2, we have completely overhauled and enhanced the group promotion feature bringing many new options to administrators looking to promote members through different group levels. To start with, the group promotion options have been removed from the groups configuration pages into their own area. You will notice that rules are no longer strictly tied to a single group, and that rules can be sorted however you desire. When you create and edit rules, you can choose which groups the rule applies to, what parameters the user needs to meet in order for the rule to be activated, and then finally, which primary and secondary groups the user will be moved in to. You can also configure the rule to remove specified secondary groups, which can be useful if one rule adds a secondary group for users, and then the next rule should change them to be part of a different secondary group (i.e. add a new secondary group, but also remove the previously awarded secondary group). The system uses the same member filters available when configuring bulk mail, and we have made some updates to the member filters area (and have introduced some new filters) in this release as well. For example, you can create a rule that only applies to members who have won the daily leaderboard at least once, or members who have created a blog. Any time a member account is updated for any reason (a new visit, editing the member, the member makes a new post, etc. ), the software will loop through all configured rules and the last rule in the list that matches the member will be applied. This approach allows you to create promotion levels, for instance when a member reaches 100 posted content items they will be promoted to a new group, and when they reach 1000 posted content items they will be promoted to yet a different new group. Groups can be wholly excluded from any promotion rules, which is useful when you have administrator and/or moderator groups and you want to ensure that they are never moved to a different group. These groups will be disabled from selection when configuring group promotion rules, and these groups will be ignored if "any group" is selected for a promotion rule. Finally, if a user is moved to a new primary group by Commerce because they have purchased a product which moves them to a new group, they will also be excluded from group promotion rules (however, Commerce purchases that only adjust secondary groups will not exclude users from being checked by group promotion rules). 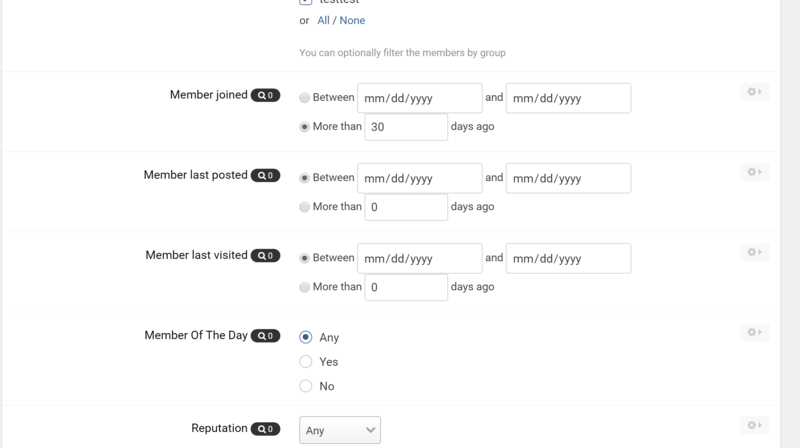 Developer note: You can add your own filters for group promotion rules (and bulk mails) by adding MemberFilter extensions in 4.2, available in the Developer Center for your application.